BlackBerry shares jumped more than 6% on Wednesday after an analyst at Morgan Stanley upgraded the company from underweight to overweight. BlackBerry shares have more than doubled in the past six months, and have gained nearly 25% since dropping below $13 in early March. 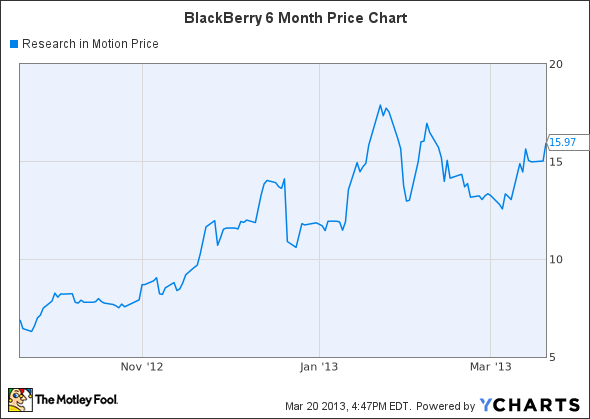 Despite BlackBerry's recent gains, I believe that the stock has significant additional upside. Analysts are still too pessimistic about the company, which continues to weigh on the stock price. However, the new BB10 devices should quickly return BlackBerry to profitability by boosting revenue and gross margin. While Morgan Stanley upgraded BlackBerry on Wednesday morning, analyst Ehud Gelblum still valued its smartphone business at zero. His $22 price target was based on the value of the services business and the "terminal value" of the company. He points out that BlackBerry probably experienced negative gross margins for its smartphone business in recent quarters, but expects gross margins to rebound to 20% long term, just enough to offset R&D and marketing costs. In other words, Gelblum's upgrade simply hinges on BlackBerry's smartphone business not losing money. This equivocal opinion is reflected in Gelblum's estimate that BlackBerry will produce EPS of just $0.23 this year, on revenue of $13.92 billion. While Gelblum's analysis seems very conservative, many other analysts are far more bearish. Vocal BlackBerry critic James Faucette of Pacific Crest reiterated his negative view on Wednesday. He argues that BlackBerry will not even be able to sell 3 million high-end phones per quarter and will have to discount its high-end models, leading to lower gross margins. Thus, he expects the device business to continue to burn cash, overwhelming the profit generated by BlackBerry's service business. Apple's iPhone has certainly eroded BlackBerry's traditional enterprise customer base over the past few years, particularly in the U.S. Samsung is also trying to gain share among business customers by adding security features to its Galaxy phones in an attempt to overcome Android's reputation for security flaws. However, as I have argued previously, BlackBerry has nearly 20 million users in the U.S., U.K., and Canada alone. Clearly, these individuals are very loyal to the brand. They likely would have otherwise switched to the iPhone or a Google Android phone already. These loyal BlackBerry fans have already begun upgrading to the new Z10 phone, where it is available. However, many of them are probably waiting for the Q10 model, which features a physical QWERTY keyboard. After all, the latter is the primary factor differentiating BlackBerry from other smartphone vendors, and is arguably the biggest barrier preventing many users from switching to the iPhone. With a captive market of 20 million to 30 million high-end BlackBerry users (across all countries), BlackBerry should have no trouble selling more than 3 million high-end smartphones per quarter after production fully ramps up. In fact, I expect BlackBerry to sell at least 5 million BB10 devices per quarter beginning in Q2, at which point the Z10 and Q10 will be available in most major markets and enterprise rollouts will have begun. BlackBerry is unlikely to achieve the iPhone's gross margin profile. Historically, this has exceeded 50%. However, high-end BlackBerry devices should still generate gross margins of 30% to 40%. While Gelblum projects an average selling price of $450 for the Z10 and Q10 devices, this seems overly pessimistic. The iPhone 5 -- which sells for the same subsidized price as the Z10 at American carriers -- is thought to have a wholesale ASP of as much as $600. BlackBerry is offering an unsubsidized price of $599, which probably means that the wholesale ASP for the Z10 is around $500. Based on a production cost of $300 to $350 (in line with Gelblum's estimate and slightly higher than the iPhone 5's production cost due to Apple's superior economies of scale), BlackBerry's gross margin would be 30% to 40%, or $150 to $200 per device. I expect a similar margin profile for the upcoming Q10 phones. Based on my estimate of 20 million high-end device sales in FY14, BB10 device sales alone would generate $3 to $4 billion of gross margin in the coming year. By contrast, BlackBerry's operating expenses totaled just over $1.1 billion last quarter ($4.5 billion annualized ). This would leave its high-margin service revenue of roughly $1 billion per quarter as almost pure profit. Even bullish analysts seem to be underrating BlackBerry's prospects for returning to profitability this year. Twenty million smartphones represent a small percentage of the high-end smartphone market (ASP >$400) -- perhaps 5% to 6%. BlackBerry would not have to lure a large proportion of iPhone or Android users to hit that sales target, in light of the likely upgrade demand from current high-end BlackBerry users. If BlackBerry can sell 20 million high-end smartphones this year (Z10 and Q10 sales combined), that should provide sufficient economies of scale to drive gross margin to the 30%-40% range. This could create significant upside to the analyst community's modest profit expectations, helping BlackBerry shares continue to rally. The article Analysts Are Still Too Pessimistic About BlackBerry's Profitability originally appeared on Fool.com. Fool contributor Adam Levine-Weinberg owns shares of Apple and BlackBerry, and has the following options on BlackBerry: long Jan. 2014 $13 calls. The Motley Fool recommends and owns shares of Apple and Google. Try any of our Foolish newsletter services free for 30 days. We Fools may not all hold the same opinions, but we all believe that considering a diverse range of insights makes us better investors. The Motley Fool has a disclosure policy.